Oh my, I wish that I found this recipe before our Star Wars house party last fall. 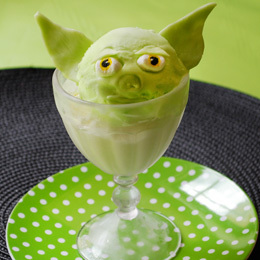 With some green sherbet and some green taffy and marshmellow you can serve this yoda treat that any Star Wars fan will love. You can find this recipe on DisneyFamily.com.